I seriously want to make many of these! 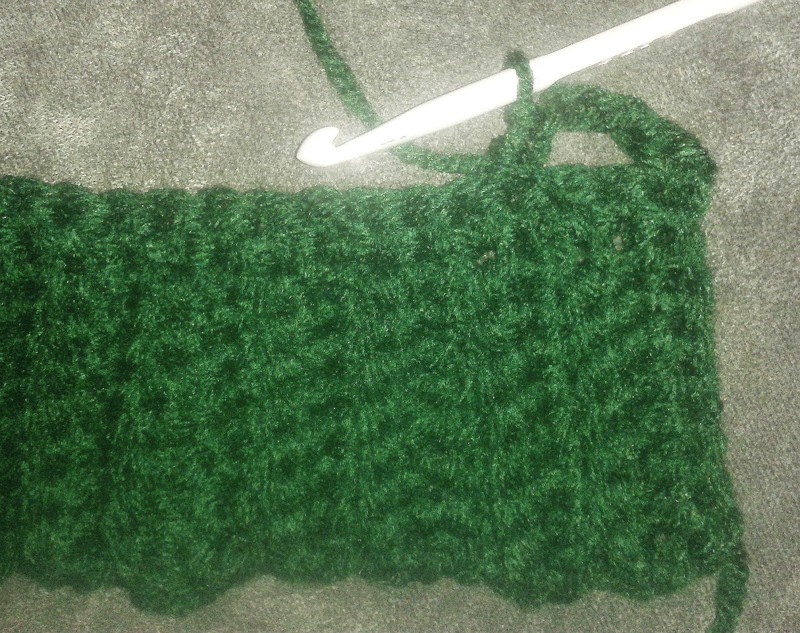 This is such an easy project, especially for the beginner crocheter. They are simple, but the end result looks amazing! 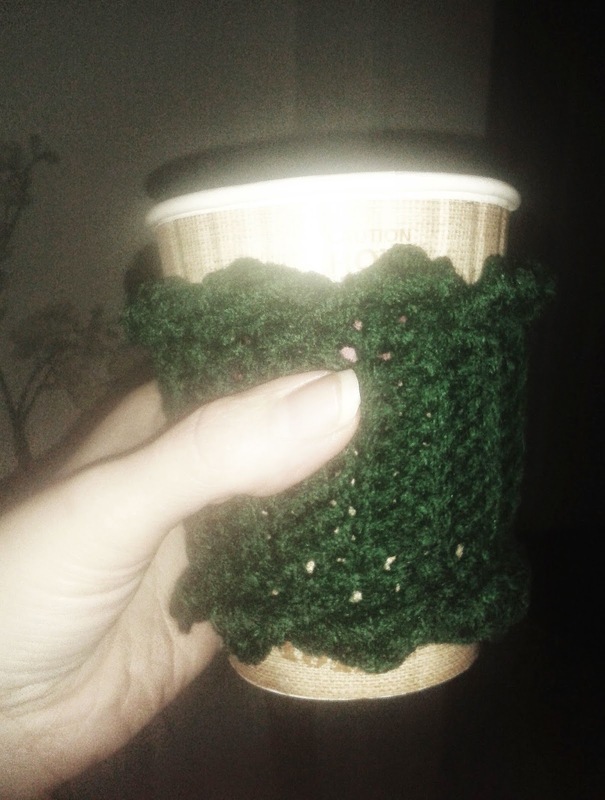 It is basically just a long chain of crochet wrapped around a cone. A great photo tutorial is included. 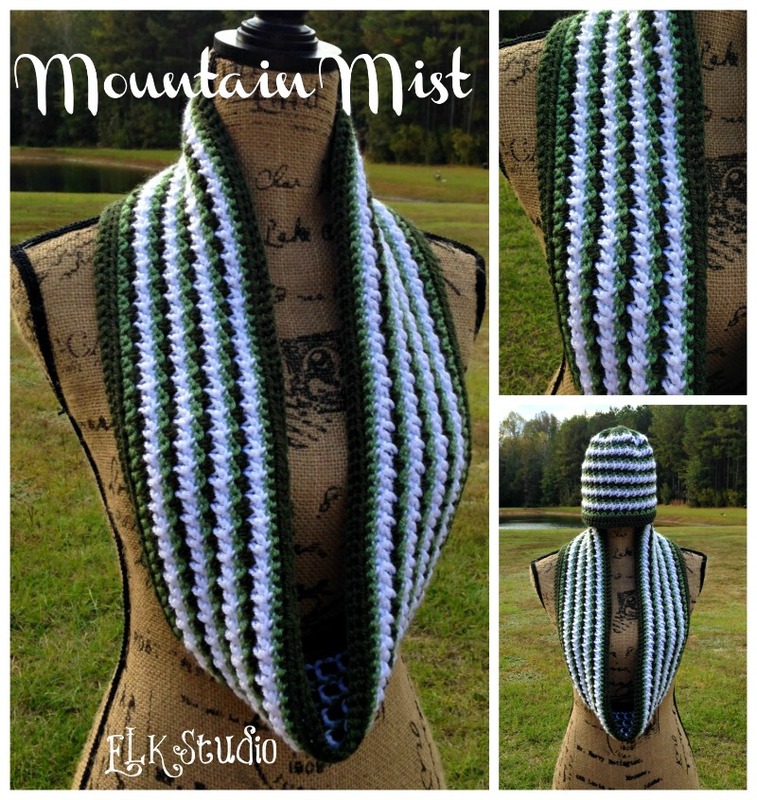 I love the color combination in this beautiful infinity scarf. The designer also has a pattern for a matching beanie hat to complete the look! Winter, snow, ice, cold, and the Abominable Snowman! Celebrate this season with a super cute theme hat that is sure to keep you warm and smiling. 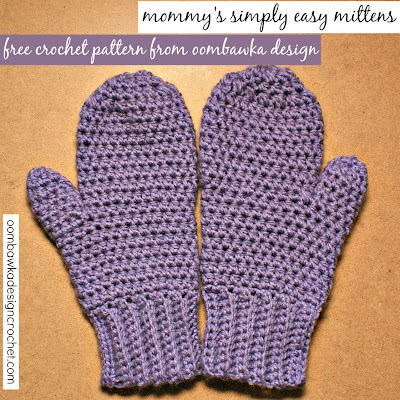 If you need a basic mitten pattern for the whole family, here it is! I like that this pattern shows a long cuff, and you can really make them fun just by using different colors and/or striping. These ornaments are just so simple, and beautiful! Using the Granny Square stitch, you can whip up these little pretties in no time. Make them your own colors, use them on your Christmas tree, hang them around your home, or attach earring hooks and wear them! A nice pattern for a cabled beanie hat, it includes a full photo tutorial and easy to read instructions! 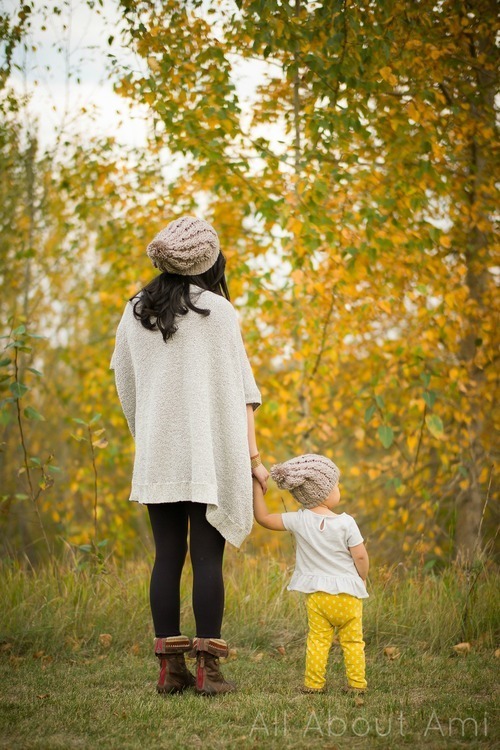 And, the designer of this hat has some really cute photos of herself and her daughter wearing one each! Lion Brand’s “Heartland" yarn in "Grand Canyon” medium worsted weight (level 4) yarn. Are you an elf in need of new boots? 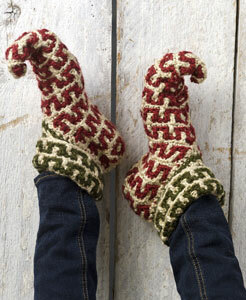 I love the pattern used in these cute crocheted Christmas themed elf slippers! Super cute! 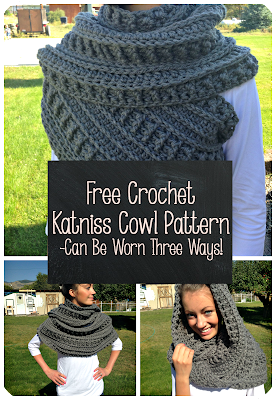 Here's a lovely cowl pattern for you today. 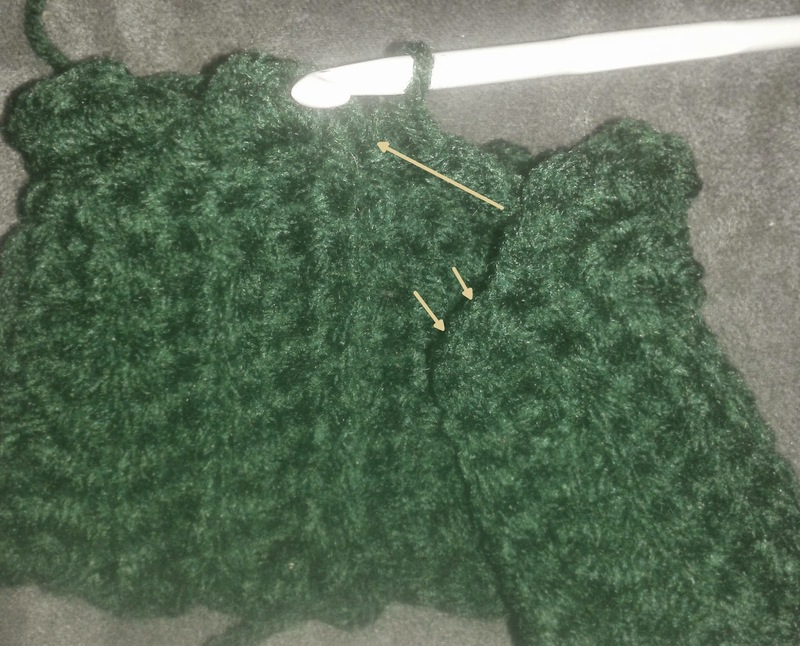 It's very easy, and you will get a good look at how the button cowl works. You could make this with several types and weights of yarn. The designer gives a great tutorial on the making of the cowl, right down to size specs, where to place the buttons, and how to wear it! two 3.3 cm wide buttons. 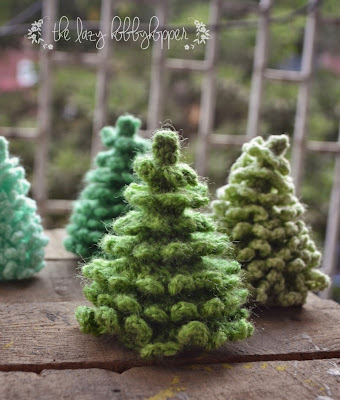 You need some cute little trees this Christmas, and these ones are perfect! You can decorate them with jewels or leave them as is, they look great either way! Everyone needs a nice pair of mittens. 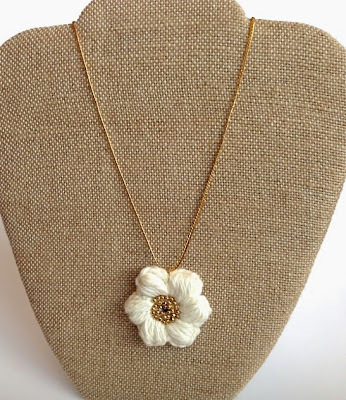 Check out this simple design and pattern from Oombawka Designs. 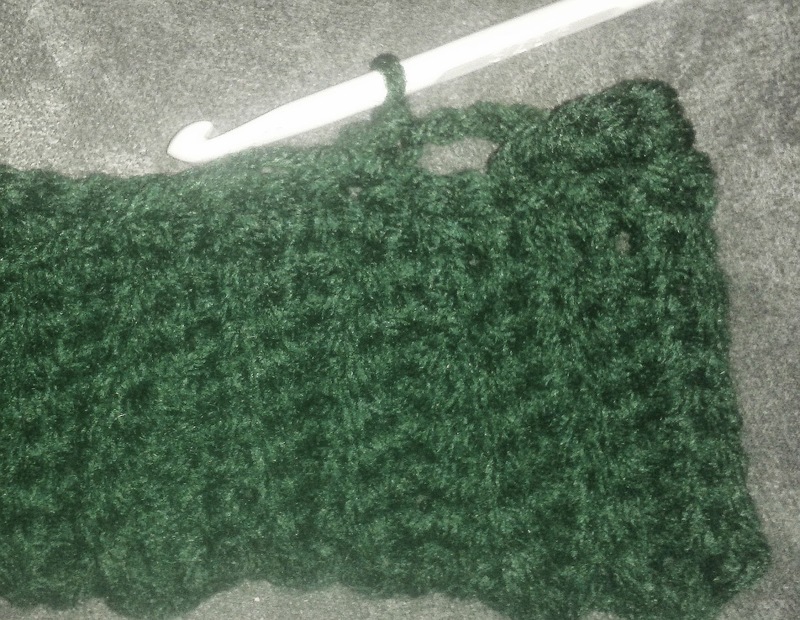 They are worked in half double crochets with a chunky weight yarn, so it should be very quick to complete a pair! What a great idea for a crochet Christmas Stocking! This pretty design uses a hexagon motif. The best part of the motif is the snowflake inside, which has raised edges, giving it a 3D effect! It looks like the snowflakes are laying on top of the stocking. Imagine all of the color variations you could use. Maybe it's time to start looking at your scrap yarns! 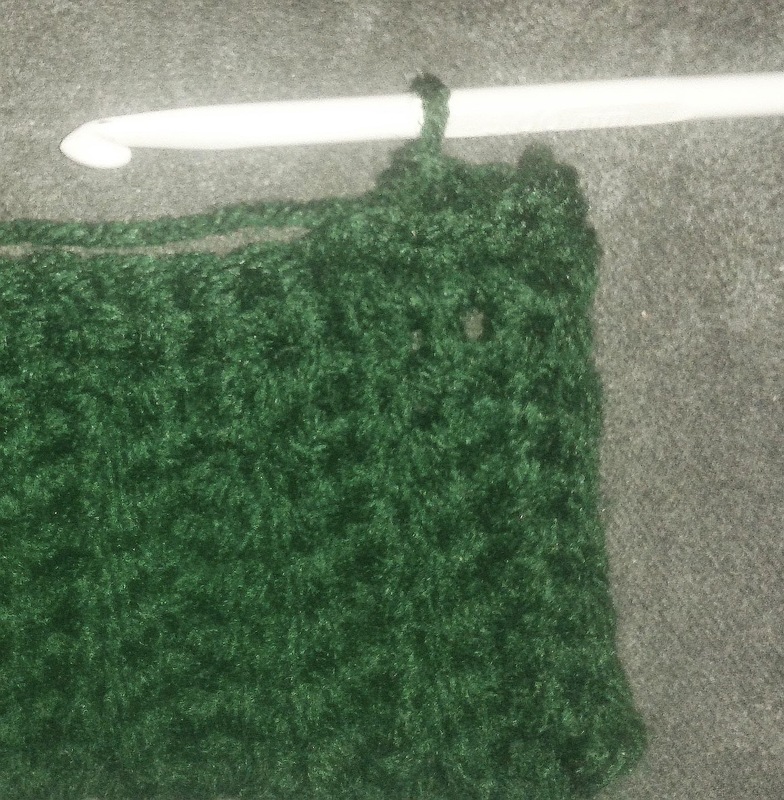 Hook size to match yarn used. Size: 4” (10cm) across the widest part and 16” (41cm) vertical drop length. So why not make money with your hobby? To be honest, starting your own business is hard. There is no magic money fairy waving her magic money wand and making you rich. It’s A LOT of work. But if you’re dedicated, innovative, and have some sense of design (which I’m sure you do if you’re a crochet master! ), you can be successful. 1. Sell live! Seek out every single craft fair, art show, bazaar, and market in your area. How far are you willing to travel? Research these events, because you need to know how long that they have been in operation?, how much traffic do they get?, is anyone already doing what you do and making the same things that you do? (stepping on toes is bad! ), who is your target audience?, what do they charge?, how much space do you get?, do you need your own tables, displays, chairs, and tents?, and is there a contract or commitment? These are very important questions to ask, because there is nothing worse than travelling some distance to sell at an event, and lose money! …Or to “break even.” It’s not a good feeling at the end of the tiresome day. On the other hand, if you find the right venues, selling your work at live events can be very prosperous and fun! You meet a lot of amazing people! Other artists, artisans, and crafters are great people to network with, because they can give you excellent advice, knowledge, tips, and share their experiences with you. This can save you a lot of time from making mistakes. Socializing with the crafty crowd is great. You will also meet wonderful customers who will become loyal to you. Soon, you will know them by name and they most likely will start asking you for custom orders! Use your intuition and you’ll make several lasting relationships. 2. Sell Online! If you don’t have time, the means, or simply just don’t want to sell live, maybe online selling is the best place for you. Or maybe you want to do both, sell online AND at live events. The internet has made this very easy for you (I use the term “easy” loosely because now you have LOADS of competition!) Rather… easy to set up! Social Networking sites, like Facebook Pages and Groups, Twitter, Pinterest etc., allow you to get the word out that you’re selling amazing things! Create a fan base and keep them updated and on their toes. Don’t let anyone forget about you! Sign up with online craft selling sites like Etsy, ArtFire, and iCraft (to name a few). No need for web site building knowledge, they do all of the extra work for you. After you sign up, you can open a shop, decorate it, add all of your information such as location, shipping, return policies, custom order info, etc. Then start adding your product! You can also join their forums and socialize with other artists. Try online local buy/sell sites. Create your own ads for your products on Craigslist or Kijiji! Thousands of people peruse through those ads every day. Use general product sites with shopping carts. For example; Ebay and Amazon . You can open your own little shop with these sites, but you’re selling not only among other crafters, but a huge marketplace of absolutely everything under the sun. Create your own web site or blog. You have the option of opening a free website with places like Blogger, WordPress, Wix, Webs.com, etc., these are great if you have a bit of design skill and you can really make them look amazing! You can add your own shopping cart for free with programs like PayLoadz, Mal’s E-Commerce, and PayPal. Or, you can also use online store builders who charge a monthly fee­­. Volusion, Shopify, 3Dcart… these sites usually include wonderful templates and shopping carts and make setting up your online store very simple. It can be hard to decide which platform to use. Research them and see which is a better fit for you. You may also want to purchase your own domain name, like www.yourname.com There are several places to buy them. My personal favourite is GoDaddy. Build your own online store in minutes! 3. Wholesale and Commissions. Maybe you’re not a salesperson! You’re just a Master Crochet Artist, and that’s all. The thought of peddling your product and talking to people turns you off, and you have absolutely no desire nor time to fool around with an online shop. Then hire someone to do it for you! Do you know of any local shops who may love to sell your product? 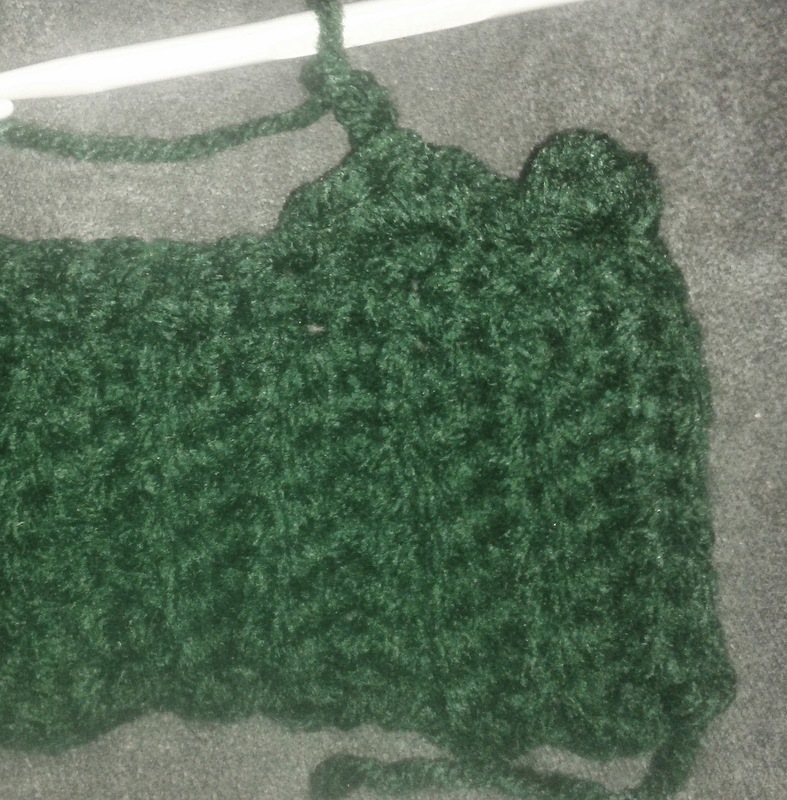 Do you specialize in making one specific crochet piece and want to sell a lot of them? Look around, you might have to talk and network with some people, but these are business owners and buyers, so be at your best! You only need to sell yourself to these people, and if you can get them to buy you… AWESOME! You’re in. All of that being said, remember that the business owner and/or company is going to take a cut. What price is comfortable with you? Is it worth it? 1. 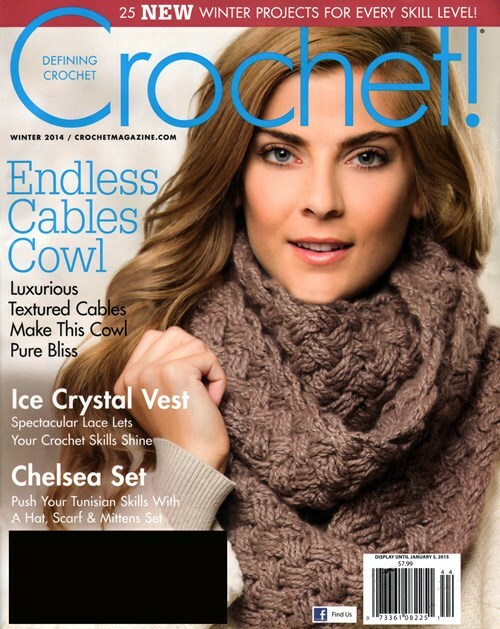 Are you a crochet pattern designer? You can sell digital versions of your patterns as many times as you like! There’s no need for printing, packaging, shipping, and tracking, you can sell your own patterns online using your website or blog, along with some added software. You want to make sure that they support digital downloading and offer a shopping cart, or else you’re going to be constantly checking your e-mail to see if you made a sale and if you have to send out a file. 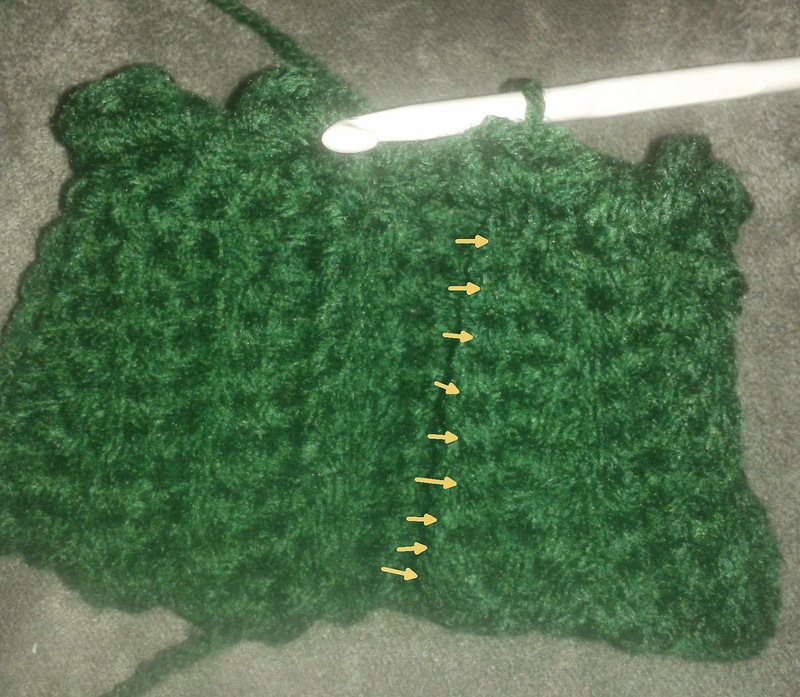 It’s more work, so I prefer to have my customer be able to directly download the pattern. If you don’t want the hassle of operating and maintaining your own website, you can also sell digital patterns on Etsy, Ravelry, and Craftsy. Open a shop and start adding your product, it’s pretty simple! Make sure that you have great photos, descriptions, and that all of your patterns are in PDF format and easy to read. Your customers, as in finished products, can and will leave reviews, so always be at your best. Answer questions in a timely manner and socialize with the seller community! Great reviews create repeat sales! 1. 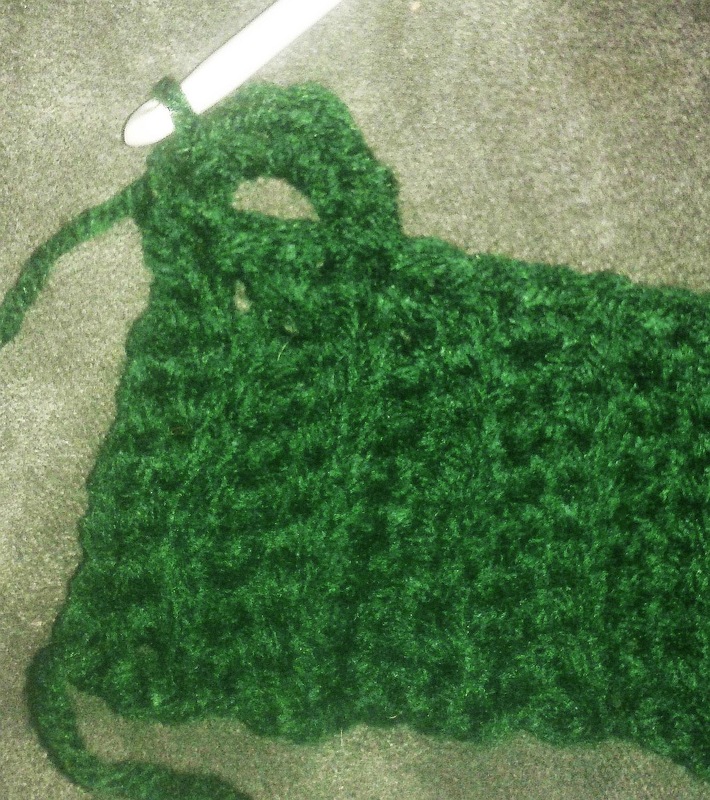 Write about crochet. Share your experiences, patterns, tools, reviews, and more! Create excellent content that makes readers come back for more. You won’t make money with just a blog, you’re going to need some help with that, like adding advertisements and becoming an advertising affiliate. Monetizing your blog will help you get that extra cash flow, but again, it’s A LOT of work! There are several companies and programs that offer these services, a few of the most popular are Google Adsense, InfoLinks, Click Bank, shareasale, PaySpree, and Commission Junction. There are “Pay to Click” programs which pay you every time someone clicks on the add or link; and then there are “Commission” programs which pay you a percentage every time someone buys something from the ad on your page. It sounds pretty easy, it’s easy to set up, however, getting your audience to click and buy can be difficult. Make sure your ads are relevant to your blog. Placement of the ads is also key. You want them to stand out, but not take away, or take over your blog. For crochet, there are some really good affiliate programs that pertain directly to crafting such as Craftsy, Free Craft Patterns , Annie's , and CreateForLess . I personally also use DiscountMags (which feature crochet magazine subscriptions) indigo (which sell crochet books), and Amazon (who sells patterns, books, and yarns). 2. Freelance writing for other blogs and sites. There are actually some blogs and craft sites that will pay you for your writing skills and services. They are hard to find, but they exist. Check out Elance, try Google searching, or start writing on Blog Platforms such as Hub Pages who advertise your article, and give you tools for monetizing such articles. You will be writing a lot if you want to make an income! And not only a lot, it has to be good! 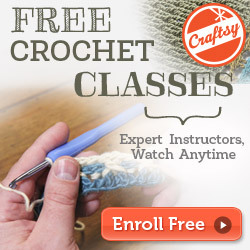 Do you have any tips on using crochet to make money? I'd love to hear from you. Happy Crocheting and Good luck! Farrah Hodgson, Designer, Blogger. 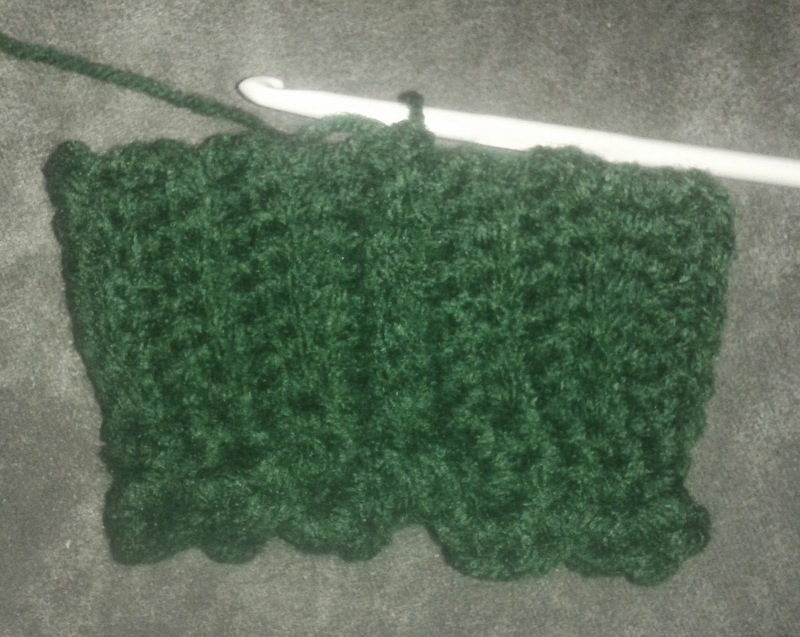 I have been crocheting for 18 years. 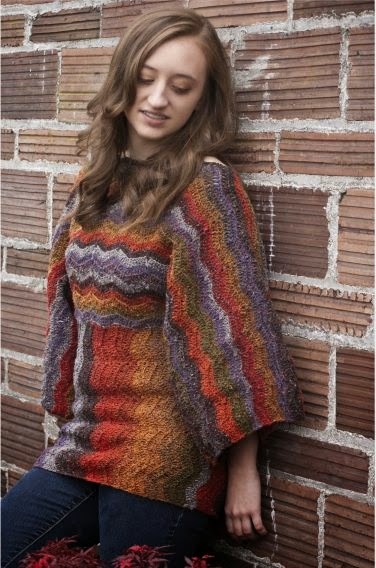 I design and sell my own patterns online via Firene Designs, Ravelry, Etsy, and Craftsy. I sell some finished product online mostly as made to order on my own patterns. I have sold full time at local markets, and now have moved on to selling at seasonal and annual arts and crafts shows and festivals. I also have some products for sale at a local boutique. The majority of my business is pattern design and blogging. 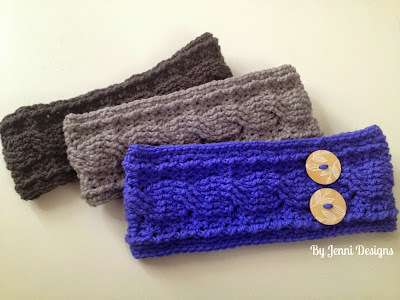 If you've been looking for the perfect cabled crocheted headband or ear warmer, look no further, here it is! This free pattern includes excellent written instructions, as well as a wonderful photo tutorial. Go big or go home! Check out this giant sized ornament made from African Flower motifs, This is definitely a statement piece and it's great! I guess it's officially that time of year again, I can't go shopping without the sight of glitter, sparkles, and holiday galore, so I call it official. I feel that it's always too early in November, but it doesn't stop me from crocheting Christmas ornaments and gifts; because they can take some time to make, and I want to enjoy them in December! 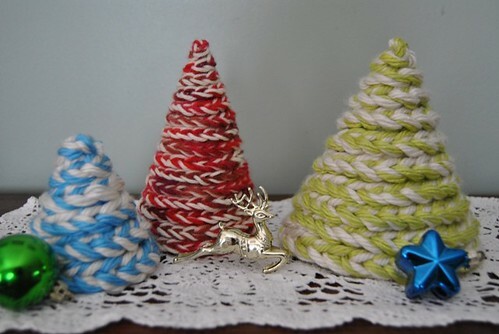 Yarn: Scrap yarn with xmas colors! Ooh so pretty! I like how the designer shows several ways to where this beautiful scarf. The colors are perfect, and the shape makes it extremely versatile! Yarn: RED HEART® Unforgettable: 1 1/2 skeins main color (A) 1 skein contrasting color (B). 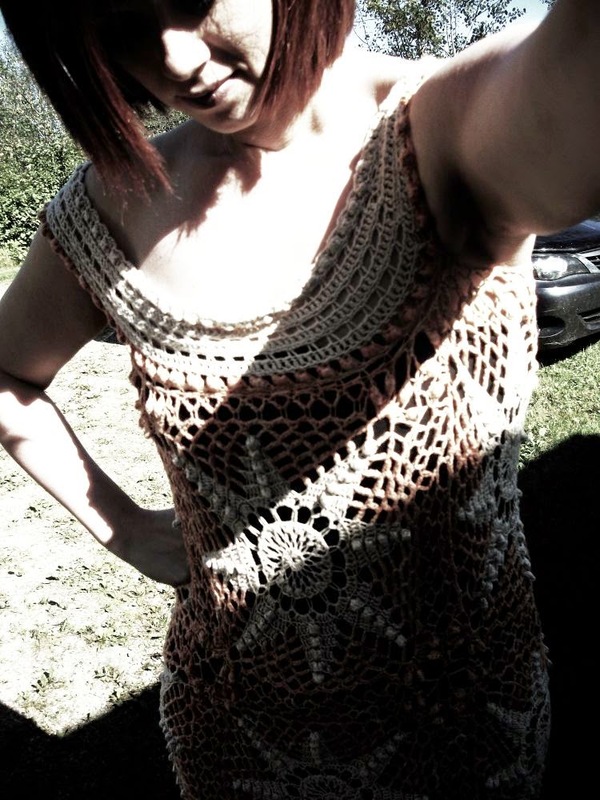 I've been wanting to give this crochet top a try for a long time now, I need more hours in the day, because I love this and need one for myself! Maybe after the holidays, I will get the chance! I love everything about this, the colors, the texture, the pattern, and the wave! 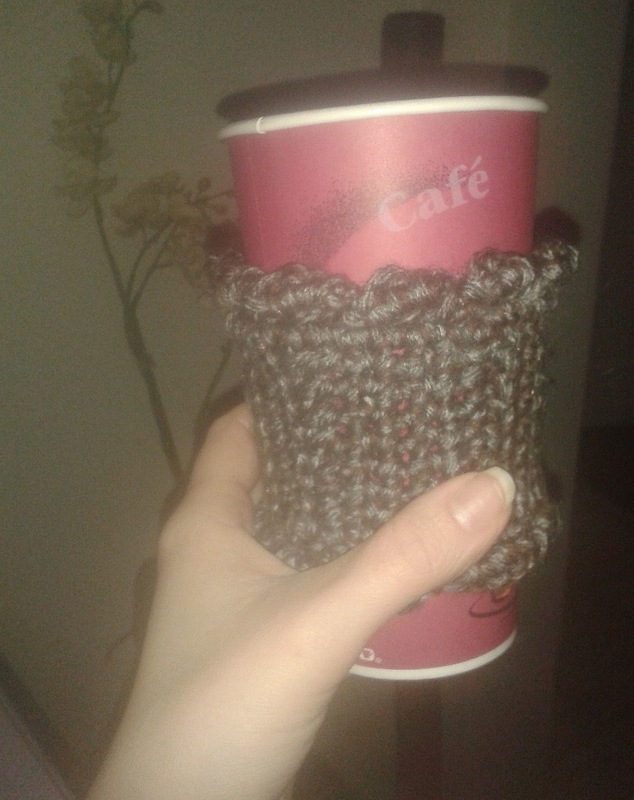 I like the idea of a reusable coffee cozy, so I decided to design my own. These are great, because first off, they're reusable, next... they are stylish, easy to customize, and really work! This pattern is pretty quick and easy, but I added the cabled border to give it some fanciness. 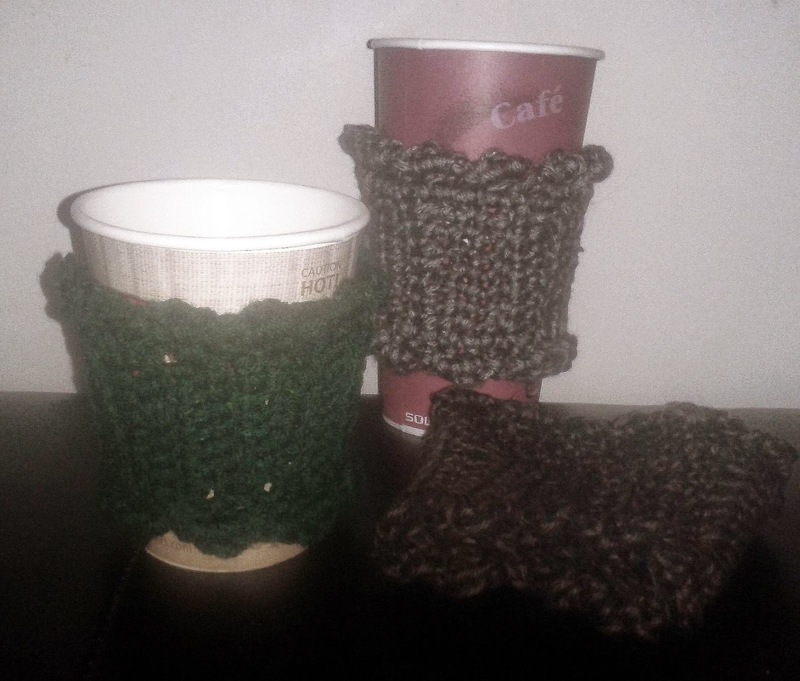 I have made these with worsted weight yarn, as well as 2 strands of fine weight yarn, double stranded. This is a great scrap yarn project! Small Ball of worsted weight (size 4 medium) yarn; OR double strands of fine weight (Size 2 or 3 light) yarn. Measurements: 8.5 inches around bottom edge; 10 inches around top edge. (Stretches); 3 inches high. Row 1: sc in 2nd ch from hook, sc in next 7 chs. Rows 2-4: Ch1, turn; sc in next 8 sts. Row 5: Ch1, turn; sc in next 3 sts, hdc in next 3 sts, dc in next 2 sts. Rows 6-9: Ch1, turn; sc in next 8 sts. Row 10: Ch3, dc in next 2 sts, hdc in next 3 sts, sc in next 3 sts. Rows 11-14: Ch1, turn; sc in next 8 sts. Row 15: Ch1, turn; sc in next 3 sts, hdc in next 3 sts, dc in next 2 sts. Rows 16-19: Ch1, turn, sc in next 8 sts. Row 20: Ch3, turn, dc in next 2 sts, hdc in next 3 sts, sc in next 3 sts. Rows 21-24: Ch1, turn, sc in next 8 sts. Row 25: Ch1, turn; sc in next 3 sts, hdc in next 3 sts, dc in last 2 sts. Row 26: Ch1, turn; sc in next 8 sts. Ch1, working along top edge, work a sc at the top of each row, add an extra sc every 5th end where there was either a dc or 3ch. (31sc) sl st in 1st sc to join. © Firene Designs 2014. All Rights Reserved. No part of this pattern may be reproduced, copied, modified or adapted, without the prior written consent of the author, unless otherwise indicated. Commercial use and distribution of the contents of the pattern is not allowed without express and prior written consent of the author. 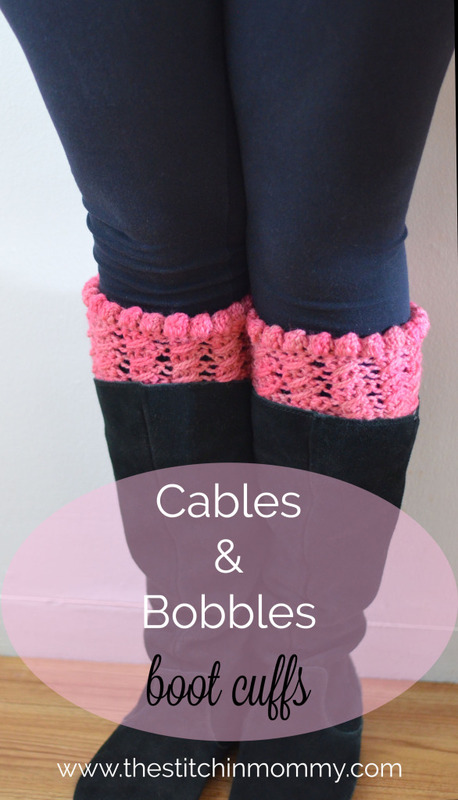 Boot cuffs can entirely add a new look to your boots! This pattern in particular, caught my eye because of the details, and it's great way to learn some new stitches.